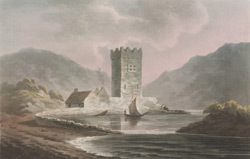 View of Narrow Water Castle on the County Down bank of the Newry River, Ireland. The castle was originally built during the 13th century by Hugh de Lacy, Earl of Ulster, however it was destroyed during fighting in the 16th century. It was rebuilt by John Sancky in 1570, at the cost of £361, 3s and 6d. Sancky became the Warden of the Castle and commanded a garrison of 12 soldiers and six horsemen. It is a typical example of a tower house: rectangular in shape, three or more storeys high and comprised of a series of superimposed chambers with the stairs and latrines built into the walls. The single tower was surrounded by an outer wall or ‘bawn’.